Looks (and sounds) like Sound! Euphonium 2 is starting off with a bang, especially when ending with a beautiful and intimate fireworks display shared between Reina and Kumiko. But before we get there, there’s new characters to introduce! First, there’s a new coach being thrown into the mix, and his name is Masahiro. He’s apparently a “professional”, and shows it through his excellent advice in practice. Masahiro also seems to be somewhat of a joker, and that’s about as deep as his character gets so far. Taki-sensei hasn’t yet left Masahiro alone with his students yet, so I’ll be interested in seeing how that turns out and what he can personally do to shape up this band and help get them to nationals. Then there’s the two new girls. Well, technically one new girl, but the other is being given attention that was never focused on her during the first season. Mizore plays the most challenging woodwind instrument, the oboe. She is quite terse, similar to Reina, and seems to have something trouble weighing on her mind. 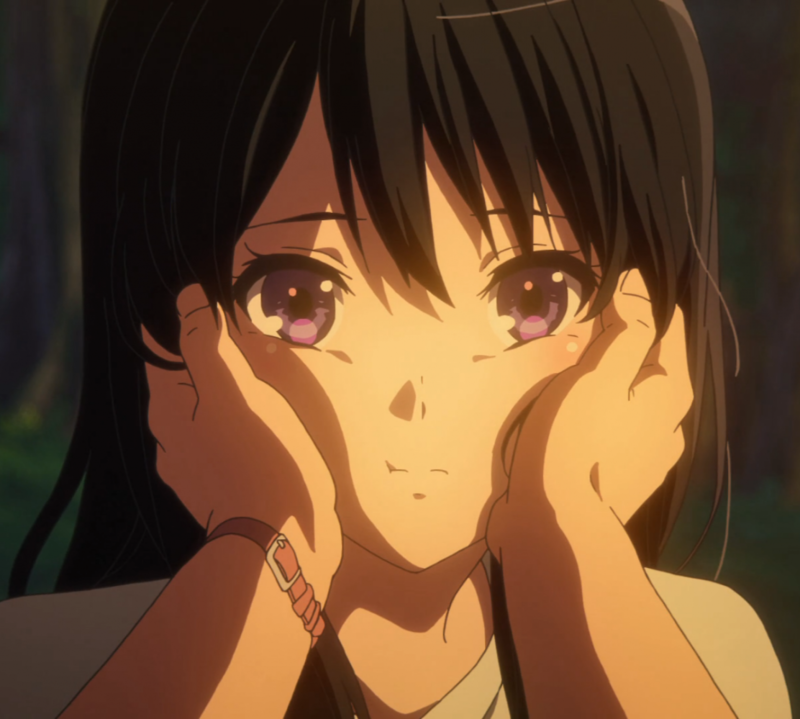 That troublesome thing is the newly introduced Nozomi, and she’s at the very least, somewhat connected to Mizore and the pain she’s been experiencing since her return. Nozomi is a flutist, and one of those infamous students that quit that one year, something touched upon in the first season. Now she’s back, and she wants to rejoin the club. More than that, she asks for Asuka’s approval specifically, perhaps alluding to the past we have yet to see of the comedic and standoffish vice-president. Asuka does not approve however, and this sparks conversation throughout the band. It even becomes a large point of discussion in the final festival scene, where Kumiko and Reina are sitting by the riverside, eating shaved ice, and more-than-casually chatting. This is what I love about these two. It’s never casual between them, not in the sense of what they actually converse about. It does feel casual in the way they talk, but the content of which they talk about is never held back and always goes beyond just pleasantries and meaningless small talk. That’s because their relationship IS meaningful, and the dynamic they now have is the wonderful result of what developed in the first season, putting them (and I as the viewer) in a much more comfortable place to move on and see what happens next. And what seems to be happening is drama unfolding between other members of the band, leaving Kumiko and Reina to reflect and perhaps step in when necessary. Or this could lead to something else completely, as I am just speculating. One thing I will say I respect is how the show didn’t offer any sort of “previously on” or overly explanatory flashbacks as to what happened before this season. It might seem exclusionary, but it’s nice to feel something that’s solely directed at you as a fan. There are casual nods towards previously conflicts, like when Mizore asks if there’s something between Reina and the girl with the ribbon. As a fan that knows exactly what happened between them, I felt a burst of glee just by it even being brought up. It’s stuff like this that shows concern and appreciation for a specific audience, rather than the overbearing nature of trying to appeal to as many people as possible throughout any given moment of the narrative. Stories are meant to be read from start to finish after all, so if you haven’t seen the first season you should obviously start with that. Although, I don’t really know why you’d be reading this if you hadn’t, but whatever.